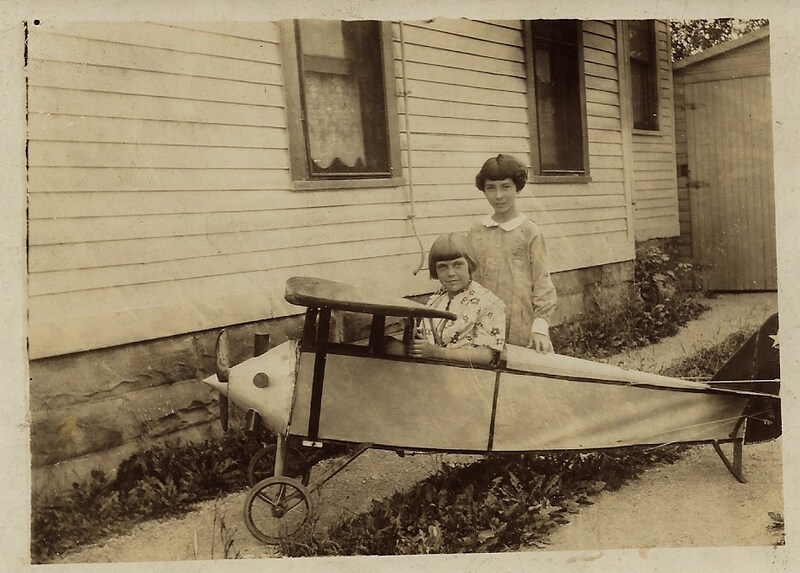 This vintage real photo postcard features two young girls playing with a large toy airplane. The plane is very detailed. Note the front wheel and propeller. This image of a vintage, possibly homemade toy airplane, is rare. The postcard’s AZO stamp box indicates that it was produced sometime between 1924 and 1949. 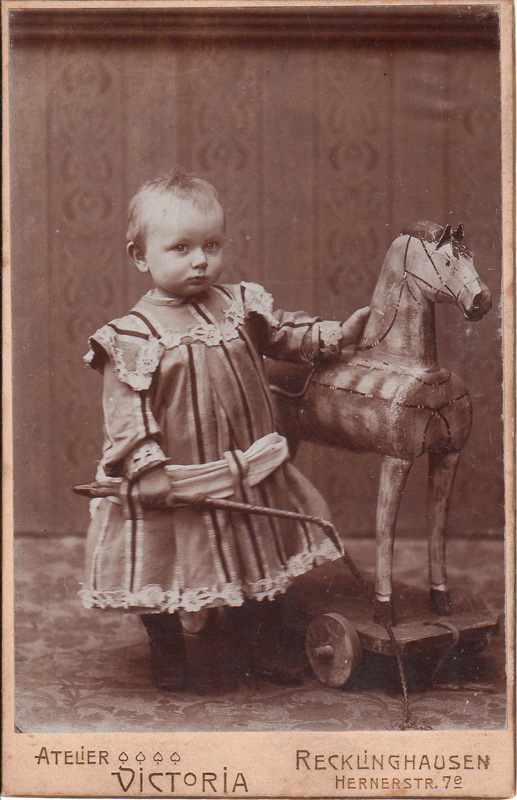 A not too happy child is photographed with a beautifully carved wooden horse in this cabinet card. The toy horse is mounted on a wheels and the horse has a mane, bridle and reins. The child appears to be holding a horse whip. The photograph is by Victoria of Recklinghausen, Germany. Recklinghausen is located in the North Rhine-Westphalia region of Germany. A young lad, Marcus Ainey poses for his Cabinet Card photograph for the Hawkins Brothers who were traveling photographers. 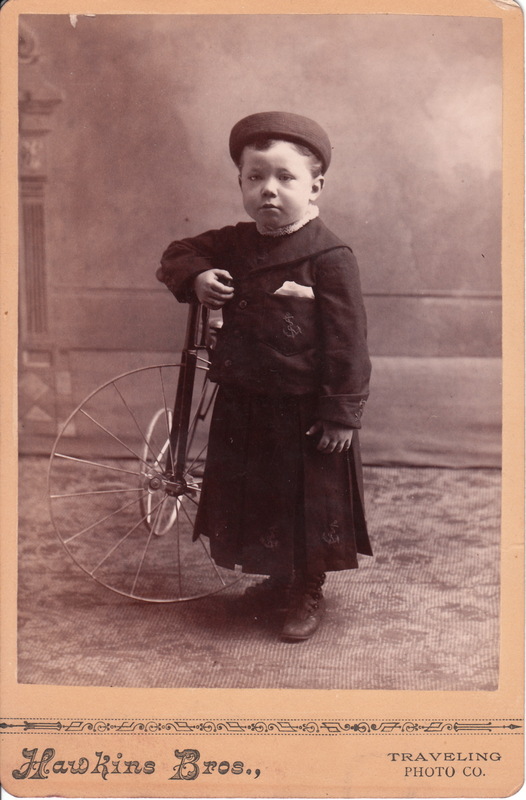 Marcus is looking quite serious as he rests his arm on the handlebars of his prized tricycle. He is dressed up for the occasion wearing an interesting cap and outfit. He has his handkerchief neatly tucked into his pocket ready for any nasal emergencies. This Cabinet Card is a portrait of a young boy and his hoop toy. He is also holding a stick which may be used in conjunction with the hoop. Note his fancy clothing and nice boots. His corn hat is on the ground next to him. The photographer and location of the photographers studio is unknown. Penciled on the reverse of the card are some identification information but not enough to be useful. The subjects name is Earle and he is the son of Lillian and the grand-nephew of Permalia S. Brittell.